I had promised to buy a curry fish head dinner at Sheraton for some fellow bloggers who had helped me out in the Oreo and Heineken posts and they never really let me forget it. ;) Unfortunately, Sheraton was closed for the week due to the proprietor being out of town so STP suggested that we head to Phoenix Court at Paramount instead. 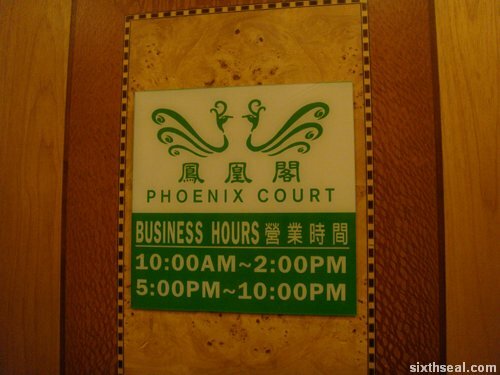 Now, the interesting thing about Phoenix Court’s curry fish head is that the chef was originally from Sheraton (which has a legendary flagship curry fish head dish) but apparently the proprietor was the only one who knew the exact ingredients so the chef didn’t have the complete recipe for it. Thus, the original Sheraton curry fish head secret recipe is still intact and Phoenix Court does a passable, but inferior version of the dish. However, that didn’t stop Phoenix Court from promoting the curry fish head as one of their flagship dishes. 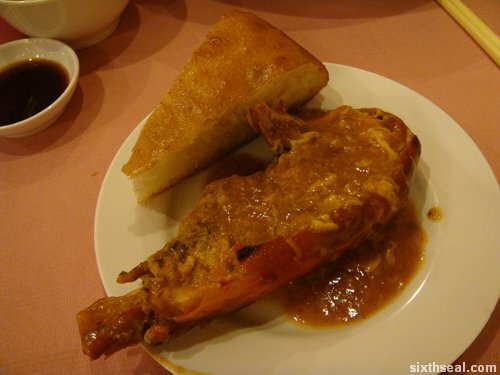 The other flagship dish of Phoenix Court is the the giant prawns in gravy. It’s served with a fried dough that’s cut into slices like a cake. I’m sorry I ordered Tiger beer, the place doesn’t have Heineken. ;) Oh, I read in the papers today that it seems like there’s going to be no alcohol served at the Chelsea – Malaysia friendly due to certain religious affiliated political parties being unreceptive to the idea. Oh well. Anyway, The Mysterious D (TMD) had also saw it fit to grace us with her presence so it was a bit of a “Welcome Home!” occasion for her as well. 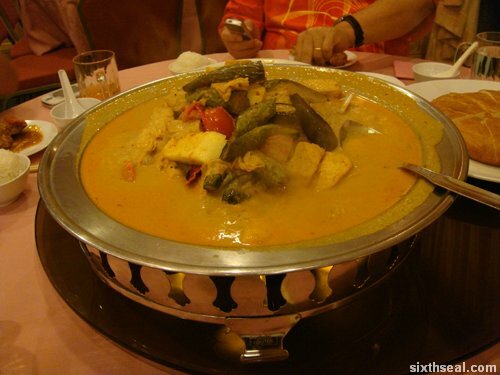 The curry fish head (RM 40) at Phoenix Court resembles the famous Sheraton curry fish head in all but taste. It still tastes pretty good though, but they really shouldn’t be comparing themselves to Sheraton. 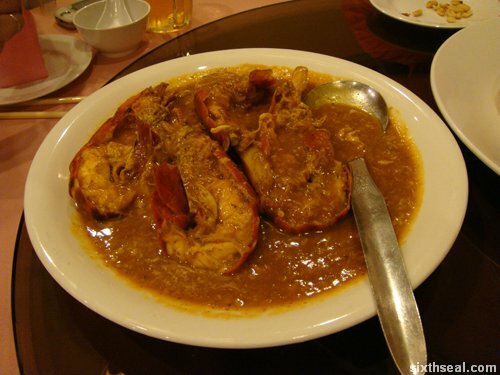 The giant prawns cooked in a special egg sauce (RM 42) is, in my opinion, the real flagship dish of Phoenix Court. The sauce is probably the chef’s secret now, and they should be promoting this instead. 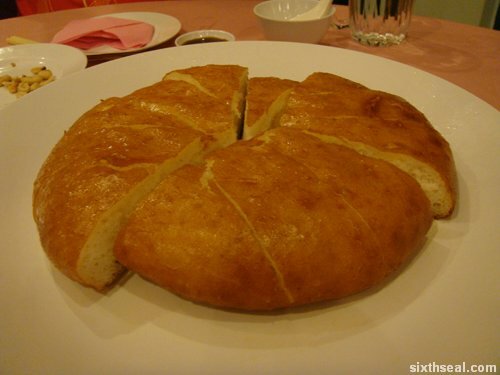 It is served with a side dish of a huge chunk of fried dough much like a cake. It serves well to soak up the delicious gravy of the dish. This comes highly recommended from me – it’s really that good. Thanks to STP, Mary and D for helping me out with the posts! Cheers! The total was about RM 107.30 which is on par with Sheraton. Nowadays, napkins also RM 1.20 okay. Paramount is like 3 minutes drive from my house, next time ajak ok, FA also lives nearby. LOL that you were even able to break down the cost of the peanuts and napkins. Is that it? Just one photo? You mean l combed my hair just for that? Hahahahaha! Seriously, given a choice now, l’d choose that prawn dish over Sheraton’s curry fish head now! Yum! Yum!! Thanks, Huai Bin. We’ll eat again sometime…food, l mean! ROTFLMAO! thanks for the dinner hb, but that’s not for the 10% ley. Hey, HB, I’ve been a bit out of action for a while but I have been catching up on your stuff without commenting. I totally love the great food you get to eat (not the rubbish fast food muck though. You really seem to be so well and that’s very pleasing. Stay sane, bro, and keep posting on the local food that I will never get here in England. Didn’t know that you were a Chelsea fan. Their training ground is in Cobham and not too far from where I live. As for myself, I can’t stick football but I know where I would stick some of that sweet food you seem to get so often; in my big, fat gob, that’s where. heh. the chelsea match and my name mentioned in the same para. was that deliberate or am i being perasan? and what!!! No alcohol? what is this country coming to? sigh. life (and matches featuring Malaysia or Chelsea or worse, BOTH) are too sad to be taken sober. heh. 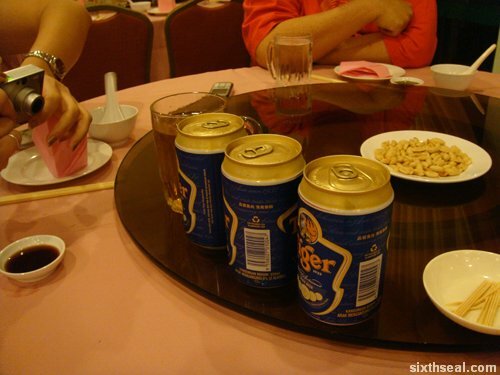 I actually like Tiger beer better than Heineken, though I am from the U.S. and Tiger is a bit harder to get. More refreshing to me. The food looks great. Sibu prawns are always the best. Next time in Sibu, you drive, I buy, lets eat like pigs. I tried the Sheraton fish head. Dont remember much about the taste, but remember waited for a long time. I want to try the Phoenix prawn dish. Looks good. HB, I think you have developed a signature “Innocent PHB look” in your camwhoring sections (not as much on this one though). LOL Those eyes especially. 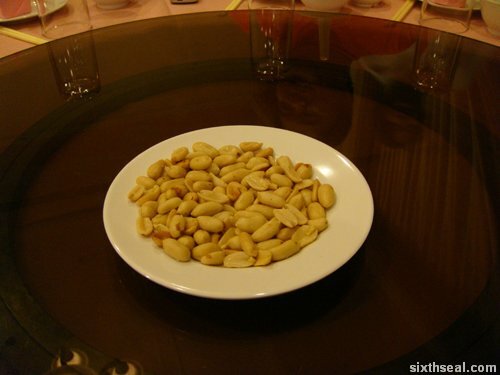 They charge for peanuts!!?? And napkins!! Sheraton’s curry fish head is way better than the Paramount version. Seriously though, this was the ONLY clear shot that came out coz of the incandescent lighting. Very bad for this particular digicam. Seriously though, thanks for helping out! I will be posting more about local food – do it later this evening when I get back from work. Thanks for the comment my friend and take care! 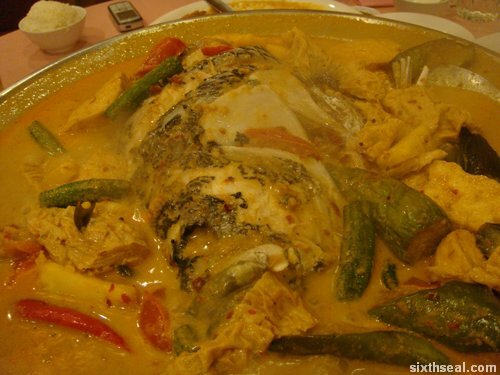 Cokelatrawkz: Yeah, curry fish head MUST be served with okra. I’m not so sure about tomatoes though, but then again I haven’t tried your dad’s version. You know how to cook it? Roland: Yeah, the fried dough is gigantic! It’s the size of a regular cake! 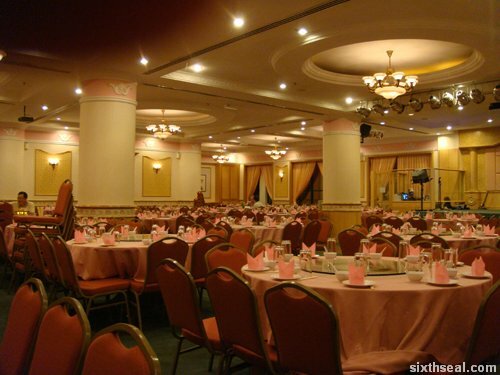 Nope, it’s Sheraton restaurant, the one that used to be at the Delta swimming pool place and now moved to somewhere near the town Ngiu Kee. clementwpy: You left Sibu already? When are you coming back? David: I prefer Heineken for regularly available beers since it’s the same price as Tiger beer anyway. Yeah, the huge prawns over here are nice, but a little bit on the expensive side though. fish fish: Haha! Yeah, since they’re so established, they can easily afford to allow people to wait for a long time. 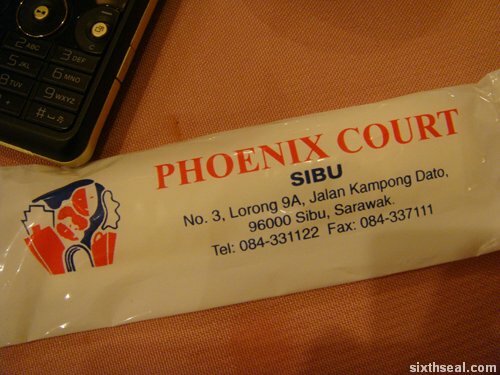 The Phoenix prawn dish is nice, I bring you when you come back to Sibu. Even took to wearing a tie to work (but admittedly to cover up a love bite la). Dr. Pepsi: Everyone charges for peanuts and napkins nowadays! I don’t know if it’s a conspiracy by a restaurant cartel or something but everyone does it now. Wahh…so big ah that prawn? Lobster is it? Wahh…so big ah that prawn? Lobster is it? 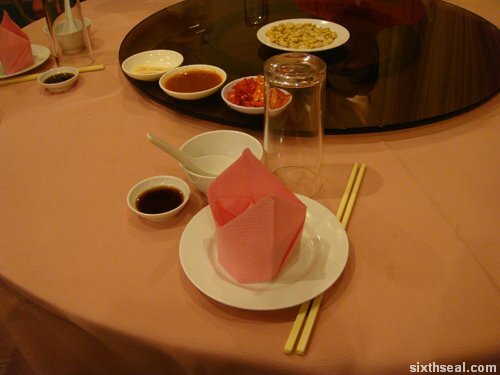 Look so tempting…ahhh, hungry hungry…. Project No.1 haven’t launched (Lokan Hunting) now wanna do Project no.2 aaarr?? Hahaahahaa…. will find a good day to cook and blog about it. eh, tomorrow can’t-larrr.. we go to Sematan, yaaaayyy!!!! nyahahahaha!~ it looks like sheraton’s curry fish head can wait till i come :P hahahaha! nkwai: Yeah! The prawns are HUGE! Waseh… STP looks so young and hansem in his bright orange T-shirt. Very appropriate for eating fish head curry. cant see the stains. KpgNangkaBoy: It’s better to wear dark clothes while eating stuff that can cause Splash Damage (TM). I just had lunch and dropped a piece of meat into soy sauce and it splattered all over the place. Luckily, I wasn’t wearing my white shirt. Beessodia: My email is sixthseal@gmail.com – feel free to email me if you have any questions. Cheers! How i may contact admin this site? I have a question. Took me awhile to read all of the comments, but I truly loved the write-up. It proved to become very useful to me and I’m certain to all of the commenters here! It’s usually good when you are able to not just be informed, but also engaged! I’m certain you had fun writing this write-up. Hi I stumbled upon this website by mistake when i was searching yahoo due to this issue, I must say your internet site is really helpful Also i love the theme, its amazing!. I dont have that much time for you to read all of your post at the moment but We’ve bookmarked it plus signed up for your RSS feeds. I am back a short time. many thanks a fantastic site. I agree together with your thoughts here and i also like your website! I’ve bookmarked it to ensure I’m able to go back & read more later on. I used to be happy to get this page.I desired to i appreciate you for this great read!! I definitely enjoying every amount of it and i also have you ever bookmarked to see new stuff you post. Hi just thought i would explain something.. This really is twice now i’ve landed in your blog within the last few 15 days hunting for totally unrelated things. Spooky or what? I’d be inclined to concur with you here. Which is not something I typically do! I really like reading a post that will make people think. Also, thanks for allowing me to comment! Hi just thought i would inform you something.. This really is twice now i’ve landed on your blog within the last few 3 weeks searching for totally unrelated things. Spooky or what? You completed several good points there. Used to do a search around the issue and located many people goes in conjunction with with all your blog. I keep hearing this news update lecture about receiving boundless online grant applications so I are actually shopping for the most beneficial site to have one. Is it possible you advise me please, where could i recieve some? Wow, that’s an incredibly nice read!